Pleasing and patriotic, this salad features green spinach, orange fruit and white cheese, mimicking the colors in the national flag of Ireland. 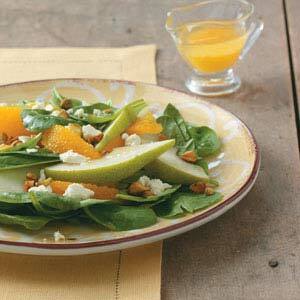 Divide spinach among four plates; top with pears, oranges, cheese and pistachios. Whisk the dressing ingredients; drizzle over salads. Serve immediately. Yield: 4 servings. Think Rainbow Instead of Green! The Best Girl Scout Cookie Recipe EVER! Tasty Green for Your St. Patrick’s Day Table! Bake eggs instead of boiling them. Toast two slices of bread together for the perfect sandwich! Which Is The Correct Apple Logo?